Students opting for private lessons in piano need to have a good instrument at home for practice. Development can easily be stunted by the improper or inadequate tools at home. At the Chopin Academy, students take lessons on fine instruments, including an assortment of well-maintained grand and vertical pianos. The instructor can help advise how to find a good instrument for home practice. Also, each studio is equipped with fully adjustable benches and adjustable footstools for the younger performers. 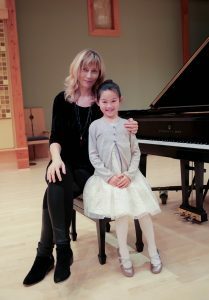 Students may opt for one of seven instructors in piano, all of whom have advanced degrees in piano performance or pedagogy, as well as years of teaching and performing experience. Each teacher designs an individual program of studies for the student and guides the student’s approach to the instrument, watchful of everything from posture, curvature of the hand, to the detail of movements and manner of playing, all while having fun. Beginning piano students learn tunes from the first lesson, all while having fun with the instructor. Intermediate and advanced students learn to refine their technique to get the most out of the instrument with the least amount of effort, and develop as artists through the mastery of interpretation. Our piano students perform the masterworks of Chopin, Beethoven, Prokofiev, and others, and have ample opportunities to be on stage. Like all students enrolled in private lessons, piano students of the Chopin Academy can enjoy frequent student recitals, usually monthly, and can freely attend all performance classes during which CAM teachers help guide performance etiquette, poise, and projection. Piano students, if enrolled in either the exam track or competition preparation programs, may also perform at more prestigious centers at which Chopin Academy of Music students may enjoy once or twice per year, such as Benaroya Hall or the Meydenbauer Center, and now Carnegie Hall in New York City.